My newest program is called 10 Easy Movements For Stronger Shoulders. ...which is a $50 discount, or 87% OFF the regular price of $57! And it comes with a 60-day, 100% money-back guarantee, so you have ZERO RISK! BUT... This is a ONE-TIME ONLY offer. This offer EXPIRES as soon as you leave this page. 10 Easy Movements For Stronger Shoulders. Scientific studies have PROVEN that strength training and home-based exercise programs are highly-effective for reducing and eliminating shoulder pain. One study concluded that “Results suggest a home exercise programme can be effective in reducing symptoms and improving function with shoulder pain.” Another study reported: “The results suggest that shoulder stabilization exercise positively affects pain alleviation and functional recovery in shoulder impingement patients.” Another study concluded that: “A specifically targeted, scapula-focused exercise program resulted in significant improvements in shoulder function and reductions in shoulder pain…” THIS PROGRAM—10 Easy Movements For Stronger Shoulders utilizes the same principles, techniques, and methods that were used in the studies mentioned above, and this is why it works so well! To eliminate shoulder pain, fully heal shoulder injuries, and get back to 100%… you need to strengthen more than just your shoulders. 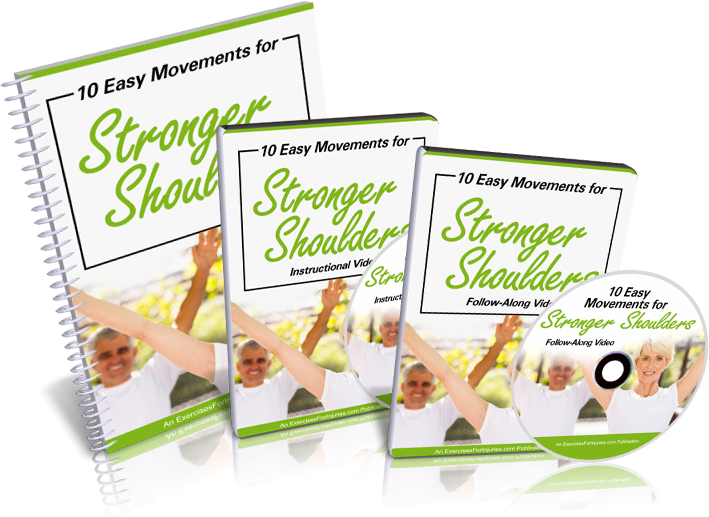 Even though you can complete it in just 8 minutes each day, the 10 Easy Movements For Stronger Shoulders program helps you build strength in all the necessary areas of your body, so you can reduce and eliminate your shoulder pain and improve your mobility, strength and range of motion in your shoulders. Many people (mistakenly) believe that if you just strengthen the shoulders, then your shoulder pain will go away and you will have improved function and range of motion. But, shoulder pain and impaired range of motion are a result of multiple areas of your body being weak and/or inactive, and this is why the special exercises included in 10 Easy Movements For Stronger Shoulders target not only your shoulders, but also the muscles in your back, arms, latissimus dorsi, abdominals, and more. Light resistance and strength training are SAFE for just about everyone. A review of over 100 scientific studies found that even older adults who have arthritis and osteoporosis can safely do light resistance and strength training (which is what you’ll find in the 10 Easy Movements For Stronger Shoulders program). You don’t have to do crazy intense, time-consuming workouts. The exercises in 10 Easy Movements For Stronger Shoulders are low-impact and easy for just about anyone to do, but still very effective! This whole program only takes 8 minutes each day to complete. Every other day is OK if that’s all you can do for now. You will get tremendous benefits from doing this program every day, but you will also benefit from doing it even just every other day. No expensive equipment needed. You can do this entire exercise program with just your body, a floor, and some simple, inexpensive exercise equipment that you probably already have around the house, or can easily purchase online or at a sporting goods store. You won’t ever need a gym membership or any expensive equipment to do this program. You can adjust this program to your level of ability and comfort. If you can’t do any of the exercises yet, we’ll show you easier versions of them, so you can still do the whole workout. We also show you how to make the exercises more challenging if and when they become too easy for you. Bottom line: we show you how to adjust this program to your exact level of ability and comfort at all times. Based on scientific research and studies. This is not just a bunch of exercises thrown together with the HOPE that they will strengthen your shoulders, reduce your shoulder pain, and increase mobility and range of motion in your shoulders. This is a CAREFULLY DESIGNED SYSTEM based on medical research, scientific studies and lots of real-world testing. SPECIAL ONE-TIME OFFER. If you add 10 Easy Movements For Stronger Shoulders to your order right now, before you leave this page, you can get the whole thing for just $7—this is a NO BRAINER! ...because I want you to reduce and eliminate your shoulder pain, heal your shoulder injuries, and increase your shoulder strength, function, and range of motion as quickly as possible! Once you learn it, which is quick and easy to do, the sequence shouldn’t take you more than 8 minutes each time to complete. In this program, you’re going to get only what you need to incorporate this easy, but powerful routine into your life, so you can strengthen your shoulders, reduce and eliminate pain, and get back to 100% functionality and mobility... so you can get back to the healthy, active, happy life you want! Give you EVERYTHING you need - exactly how many repetitions and sets you should do, time and intensity, what you should feel as you do the movements so you know you’re doing them right, and more. This video is your personal coaching session with me. In it, you will do each of the 10 movements following along with my exercise assistant, who does them on video with you, while I count out time and reps, and coach you along the way. All of the gentle, but highly-effective movements you’ll use in this program. Each is explained in detail, with precise step-by-step instructions. Tips and advice on everything else you need to know, like: number of repetitions, number of sets, how long each repetition should take, exactly what you should feel as you do each movement so you can be sure you’re doing them correctly, and how to progress if they become too easy. for the insane price of $7! Stronger Shoulders is my newest program, I want you to have it for just $7! Get INSTANT ONLINE ACCESS to the 10 Easy Movements For Stronger Shoulders. You get lifetime access to everything 24/7/365, on any computer or mobile device. No thanks, I will pass on this ONE-TIME ONLY OFFER… and I realize I will never have this opportunity again. 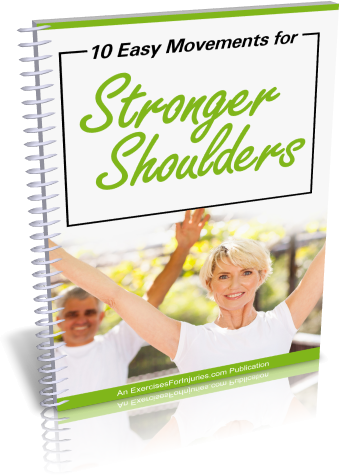 NOTE: The 10 Easy Movements For Stronger Shoulders program is a set of 2 downloadable videos and 1 PDF file. No physical products will be shipped. After you order, you will get INSTANT ACCESS to download the videos and PDF file. The PDF file can be viewed on Mac or PC. The video format is M4V which can be viewed on Mac or PC. If you have any questions or need help, you can contact us at support@ExercisesForInjuries.com.